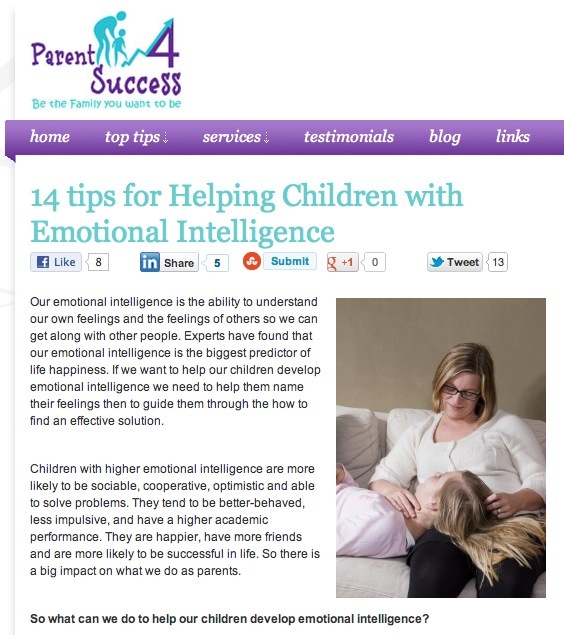 An excellent post by Elizabeth O’Shea with 14 clear, powerful ideas about being an emotionally intelligent parent. Here are the first 3 – how would it be to put these into action? 2. Help them label their emotions. With pleasure. And thanks to you for sharing the good advice – which I will keep endeavoring to practice! Label the feelings is the key tip. For this one needs to pay attention to the feeling. Mere staring at it brings the intensity of the feeling down. Hippocampus as well as Amygdala do not bring in emotional memories not connected to the label and thats my understanding of importance of labeling. Thanks Josh and Elizabeth O’Shea for a wonderful insights. Thanks Joshua for letting us know about Elizabeth’s work. So many adults I coach are eager for help with raising their children to be emotionally healthy. It will be a pleasure to introduce them to Elizabeth’s article and website. Thank you Joshua Freedman for sharing this article. Elizabeth O’Shea says so much,so well! Her way of going about each point with examples makes it self-explanatory which in turn will help to adapt to our ways. Who understand emotions become more attentive” I have been looking for a suitable one for adults. You post this of Elizabeth O’Shea,such a match! The question you have posed is seeming a tough one for me,Joshua. To me,each of the 14 points of Elizabeths’are so closely interrelated. So to pick and choose one is seeming difficult. I would choose point 2, naming feeling as important. By naming my feeling, I am able to convey what is happening within and with me. Naming the feeling helps to regulate emotions. The most difficult thing for us is to get our 8 yr old child to talk. Her immediate reaction is to clam up and say she doesn’t want to talk about it or say I’ll talk about it later. We consistently try 1, 2 and 3 above – we’re not giving up on it but we are still not seeing the break through we hoped for. Hi JU, does she ever say why she doesn’t like to talk about it?